Edited to address some comments/questions: The fix described below is for those of you with a google account. For example, I believe that if you have a "gmail.com" email address, a blog through blogger, or otherwise have a google account, this fix works for you. I'm sorry if this caused confusion. Nevertheless, if this fix does not apply to you, and you want to be able to be contacted if you've won a prize or asked a question, then you should supply your email address in your comment or continue to check back to see if your comment has been addressed. I tend to reply in the comment section itself. Thanks! Part of being a good blogger is engaging in a bit of back and forth with my readers. However, most of the kind folks who leave comments here are "no reply" commenters. 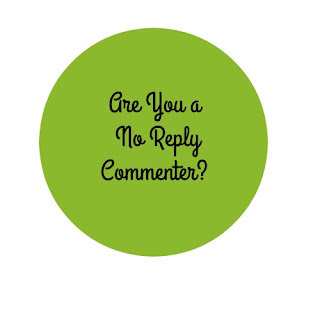 When I get an email notifying me of your comment, you are listed as "no reply" commenter, meaning I cannot reply to you. If you are hoping to be entered in a giveaway, or asking a question, there is no way to contact you. In addition, sometimes I'd like to send someone a note to thank her or just respond off the blog, but I cannot. Moreover, if you enter a giveaway with the name "Anonymous" and are a no reply commenter, it's a guarantee you aren't going to win. Rather than try and describe it, I'm referring you to my friend Amy Tsuruta. Amy has been raising this issue for a long time and wrote this blog post last August that describes the problem and how to fix it. It's not hard!! Just scroll down that post a bit for the step-by-step. In fact, I was a no reply commenter until I read Amy's post. Please read the edited portion above! Sorry for the confusion. I'm with Unknown/Lu C, I went and read Amy's info several times but have no idea what we are actually supposed to do, especially if we don't have a blog. Some blogs you have to enter your email to post a comment (your email is not posted), other blogs you can only comment as anonymous if you're not on facebook or any other social media sites. Would love to learn what I'm doing wrong and change it but am totally lost. Thank you Joan. I missed Amy's link, no wonder I was so confused. Now it makes much more sense... if I had a google account. Thanks for bringing this to our attention. Thank you and thanks to Amy- I had no idea why I could reply to some comments and not others and how mine was set. I really appreciate this helpful advice!! WELL, THAT EXPLAINS WHY I NEVER WIN ANYTHING!!! Hi Joan. Thanks for this info. I had no idea! So this is my "test comment". I (hopefully) made the appropriate changes to my profile, and now you should be able to see my email address. thanks for this -- I had no idea! so can you see my email now?